this is my own concoction of the famous Ginger sauce that goes with the Samsui Chicken. Hubby said its very good. Maybe because I have added home made Rice wine. this is old ginger. The skin is darker, usually a light brown. 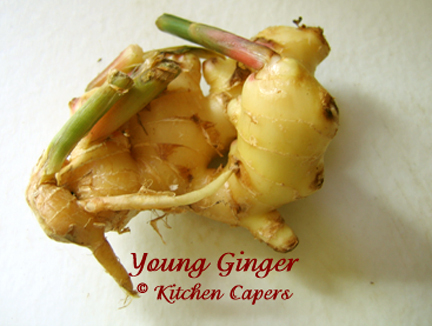 this is young ginger. You can tell by the skin. its lighter in colour, sometimes almost 'translucent'. 1. 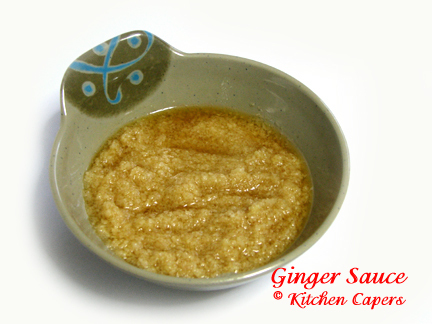 Blend ginger with chicken oil, sesame oil till fine. 2. Mix it in a small glass pot or ceramic bowl with the rest of the ingredients. 3. Leave it aside to stand for 2 hours. 4. Serve with cold chicken. uneaten ginger sauce to be kept in the fridge for upto 2 weeks. 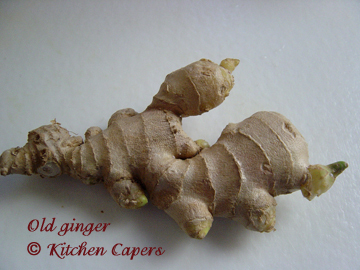 if you want a more spicy ginger flavour, use more old ginger. John 14:2 In my Father's house are many rooms, I am going there to prepare a place for you. Our Heavenly Father has prepared a 7-Storey mansion for Andre and our Family. PTL! no wine, omit it. if not use a very good white wine. best to use a sweet wine. that bowl of ginger sauce, hubby alone ate 3/4 of it. :shock: luckily I made 300g..
Gina is there any way to subsitute chicken oil? of course you can substitute chicken oil for corn oil. But the fragrance is not there. yes, its just to take out the yellowish fat at the cavity area of the chicken. Put it into the wok and fry over high heat. it will melt and what is left there is the oil and dried up fat. same method with the pork lard oil..
Arh I see Gina ... thanks for the tips. this is the fats you use to cook the chicken rice. so that is why the HPB(Health Promotion Board of Singapore) says chicken rice is very unhealthy for hypertension, heart problem patients. Wow, Thanks for this recipe, Gina. shao xing jiu is not rice wine. Rice wine is colourless like water. Thanks for sharing the recipes,my family like to eat steam chicken with gingers sauce. yes, its just as good. but better if you have a good rice wine or a very good white wine. Is Shaoxing wine considered rice wine?